Decorative safety railings, low-maintenance materials, angled post caps, and a companion screened porch make this custom deck practical and attractive. 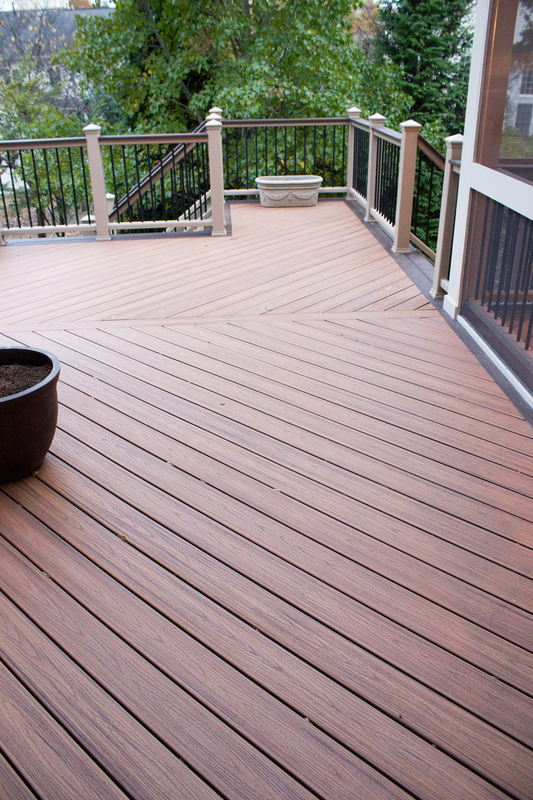 There are many practical features to consider when designing custom decks in South Riding, VA. Here are just a few that will make your outdoor living more comfortable and convenient. Affordable custom deck features for South Riding, VA, include built-in storage and seating, low-voltage lighting systems, decorative safety railings, fire and water features, and unique accents like light fixtures and post caps that can enhance your individual style and architectural flair for maximum impact with a minimal investment. Custom deck lighting is not mandatory, but provides an extra layer of safety and security for new custom decks. South Riding, VA, homeowners should consider task lights, accent lighting, and the use environmentally-sensitive fixtures. Functional, decorative accents, including post caps, light fixtures, and railings, provide more than just eye-pleasing art. Each component performs a critical function on custom decks in South Riding, VA. Post caps redirect water flow to combat excessive deterioration and runoff that contributes to issues with drainage and erosion. Lighting is an essential addition to your custom deck plan that enhances the safety and security of your landscape and extends the enjoyment of your new deck long into the night. Railings are critical to passing inspection while providing critical safety for family and guests. Hal Co. offers comprehensive design/build services for custom decks in South Riding, VA.
Built-in features top the list of must-have items for graceful, luxurious outdoor living. Storage and seating are essential components of gracious custom decks. Dual-function elements save space and time, and offer smart solutions to common complaints with ordinary deck designs. Fire and water features recreate the ancient elements of heat, light, and magnificent meditative focal points for extraordinary custom decks in South Riding, VA.
Give thought to a multi-level deck configuration of thoughtfully-placed, visually distinct platforms that can optimize small or unusually-shaped outdoor spaces, or break up a larger, more spacious property. Focus on closely coordinated colors, textures, and patterns for deck surfaces, railings, and specialty features. The most prominent color featured in 2015 is gray, but colorful custom deck inlays in South Riding, VA, are also increasingly popular as people explore artistic and unique custom deck designs. Simple, thoughtful custom deck features make South Riding, VA,, decks comfortable and convenient. With a wide palette of materials, colors, textures, and patterns, the ability to express your artistic side is limitless. Designing custom decks, is wholly dependent on your creativity and budget. But the secret to satisfying your outdoor dreams is choosing the right deck contractor. When you are ready to make an investment in custom decks in South Riding, VA, contact the reputable deck experts at Hal Co. With over a quarter century of experience, we have the design knowledge, construction technology, and deck installation expertise to make your custom deck dreams spring to life. Hal Co. – when you are ready to elevate your outdoor living to a new level of comfort.